I received my Moxie tank car yesterday and have mixed feelings. It is the first S Scale America piece of rolling stock for me and overall I feel the quality of construction is quite good. The issue is in the application of the graphics which leaves a bit to be desired on both sides as can be seen in the photos along the bottom edge. Am I being too picky here? Should I ask for a replacement? What would you do? Thanks in advance for your replies. I would want a replacement. That shouldn't have been shipped period. I wouldn't let it go. I always have the suspicion that these companies take advantage of the niche status/lack of competition/what have you of the market. We as consumers in this market tend to let these things slide for the same reasons. Definitely request a replacement. I have plenty of SSA rolling stock, and they all have excellent graphics. So something went awry with yours, and I am sure they will want to get you one without flaws. FLYERRICH I sent Doug Peck at Portlines the link to this thread. He said they will replace it. Contact him or someone else at the club. Okay Mike, thank you. Email sent to Doug. Thanks to all for your opinions on this matter! Replacement received today from Doug Peck and all lettering is perfect! I'm glad you got a replacement. Sorry it doesn't look as nice as this one. Beauty is in the eye of the beholder as they say. Fortunately though, mine will only travel on realistic 2-rail track. UPDATE: September 6, 2018----We are still awaiting delivery of the last 300 MOXIE convention tank cars, which are still in China waiting for final assembly of the trucks. Our understanding is that the wheelsets were made in a separate factory from the cars themselves, and that factory closed without notice last month, delaying the delivery of the wheelsets. Just after the convention closed, we received the first 200 cars, and soon afterward began packaging and mailing them out. After sending the first 100, we have had a very few reports of damaged cars, which upon return we are replacing, but as a result, we are now opening and checking every car before we package and mail the remaining cars. Please be patient if you are awaiting receipt of your cars. The process will continue until we have filled all orders. Orders are being filled in the sequence in which they were originally received. Check back on the convention website (bsgr.us) for future updates as we get more information. Meanwhile, there are still about 60 pair of cars available, so don’t hesitate to order. 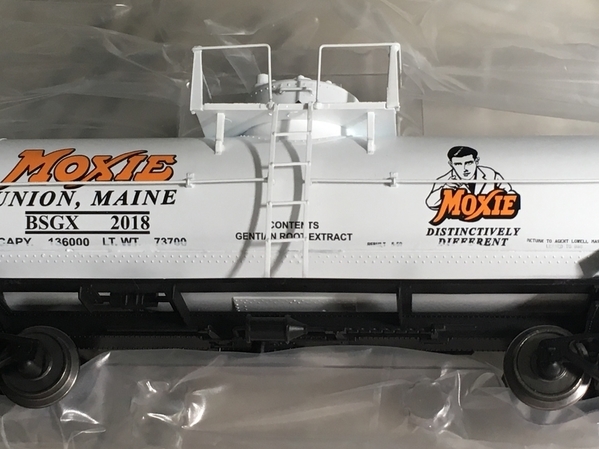 My sample of the Moxie tank car arrived this past weekend. It is lovely job and right in every way. Thanks to the Bristol club for worrying these through and getting the decoration problem resolved.